Last week I foreshadowed further discussion of the 'journalism of empathy', which Eureka Street has aimed to practise during my ten years as editor. I thought it was a term I'd invented, but it turns out that it's used in journalism schools, particularly in the US. Journalism academics recognise that many of the best fiction and non-fiction stories eschew hard facts and egocentricity in favour of imagining the world through other people's eyes. Objectivity is really not what they're about. Journalists get paid for accurate reporting of events, and indeed there has been a number of journalistic fact checking initiatives in recent years. But that's not where it ends. The news is produced for consumption in a human context by readers who often care deeply for the wellbeing of other people. Media consumers will turn off or react negatively when there is insensitive reporting. For some media it's a commercial decision, but for us it's a matter of mission. We learned a lesson in our early days online when we were feeling our way and insensitively used the death of 'Crocodile Hunter' Steve Irwin to implicate him in the exploitation of animals for the entertainment of humans. Over the years we have received many quality articles analysing the dynamics of national and international politics that have overlooked the human dimension. We've often declined or sent them back to the writers for revision. Our main interest in Australia's taking part in bombing missions in Syria, for example, is not whether we're likely to contribute to the 'taking out' of ISIS, but in how our actions affect civilians on the ground. Obviously our approach has been affirmed by Pope Francis' resolute adoption of mercy as his modus operandi, which involves less emphasis on teaching doctrine in isolation from human need. It underlies our decision to give so much space to addressing the situation facing asylum seekers and how they are received by the countries that they hope will welcome them. I was also prompted to think about empathy by some recent political events, including the Abbott Government's decision to take 12,000 Syrian refugees in addition to the regular quota. Whether or not the motivation was political, it's actions that count. Which was indeed the case with the Immigration Minister's display of negative empathy in his joke about the precarious climate plight of Australia's friends who live in Pacific Island nations. I won't be part of the future of Eureka Street but I know there will be continuity in its carrying out of its mission, largely because its direction over the past decade has been a function of our team as much as it has been from me as an individual. I like to think that the secret of our success is that we all like each other and our personal ambitions are modest. We are only to happy to share this with politicians from the parties that struggle to maintain unity. 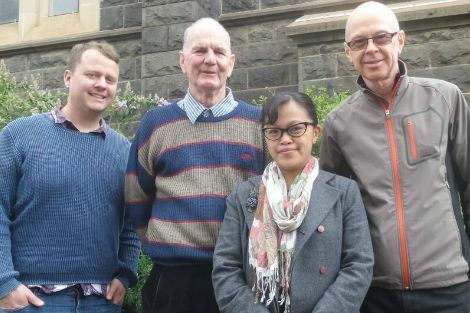 The current members of our team are myself (editor 2006-15), Tim Kroenert (assistant editor 2007- and acting editor from Monday 21 September), Andrew Hamilton (consulting editor, 1991-), Fatima Measham (consulting editor 2015-). Past Eureka Street online team members are James Massola (2006-07) and Ray Cassin (2013-14). Michael Mullins was editor of Eureka Street until 18/9/15. His social media links: Posthaven, Twitter. Best wishes to you, Michael, and my hopes that your journey takes you everywhere you wish to go. Thank you for what you have given, which has helped to provide a compassionate and intelligent voice in what is often a media wilderness. Empathy is the attempt to enter into other people's feelings to understand them. It can be the beginning of reaching out to them. This consequent reaching out is why I think both Pope Francis and Eureka Street are successful in engaging, challenging and changing people. A purely cerebral approach in journalism can turn people off. Ditto with religion. I am amazed that such a small team - with a wider array of contributors - has achieved so much. It is very much to do with the quality of the people involved and their skills. The fact that they all have a genuine moral compass is also important. Their approach is sensitive and aware. It acknowledges that other people are also entitled to respect. Farewell and thanks, Michael, and blessings on what you do next. Eureka Street has been a truly magnificent contribution to Australian life. In the first place it has featured men and women superbly knowledgeable in so many fields. But above all the achievement has been to hold up the values of goodness: truth, bigheartedness, honesty and compassion to an Australia that trusts in them and wants to see them kept paramount in the national consciousness. I have absolute confidence that the gifted, discerning and hardworking team will not move from that path. We will continue to hope from them what Eureka Street has given us all along. As for you, Fare forward, voyager. God be with you all. Media, please note that the first lot of Syrian refugees has already arrived at the Vatican. Who will be next? "imagining the world through other people's eyes." Achieving a view of the world through the eyes of all the people of the world would be a balanced universal view, hopefully approaching the view God has, and leading us to aspire to the ideal in Edwin Hatch's hymn, "That I may love what Thou dost love, And do what Thou wouldst do." Seeing the universal view can be a necessary step, but needs a further lift to achieve the vital stage of universal love. For 'Love changes everything', which is why the First Christians made such an impact on the world they knew, until the political power of the Roman Empire sidelined it to some degree, and from which it has not yet fully recovered. Michael, if you actually knew anything about Tony Abbot you would not be surprised at his support for oppressed minorities. And as for that joke, what actually happened (and what cannot be used as a defence for diplomatic reasons) was some irony being expressed at a certain participant being late for a meeting. When the truth gets distorted by agenda and tribal beliefs (as has happened here) the damage diminishes us all. It seems to me that Labor reserves its strongest hatred for those whom they see as stealing their agenda. Tony Abbot did more about social justice issues than Labor in recent times. Labor claims the cause as their own but actually do little about it. Michael, goodbye and best wishes. Eureka Street has, and I hope will continue to be, a very important source of information and encouragement to me as a concerned Australian and a committed & thinking catholic. Good luck in whatever you choose to do in the future. Thank you, Ron. Thank you for your many years of dedicated service. Greatly appreciated by this reader. Somewhat late, I join with other readers and writers (from a wide diversity of viewpoints) in bidding a sad farewell to Michael as such a fine editor, and warm good wishes to his successor and the team generally.. Eureka Street is simply unique, and Michael's essay on 'the journalism of empathy' explains why. I had never understood how the tooics on which I chose to submit articles over the years, and the editors' decisions on those submissions, stemmed from an unarticulated commitment to a journalism of empathy: but if makes absolute sense, looking back. Eureka Street's trademark editorial gift to readers is that it is generally not "bleeding heart" journalism. It is hard-headed, realistic, but - that word again- empathetic. A perfect example was Michael McVeigh's superb essay on Adam Goodes this week. It is a piece Goodes could have read with pride and pleasure- I hope he sees it - and it was just in its excoriation of all AFL fans - not just the racist booers, but all the rest who sat by and did nothing to silence them. One would not find such strength of judgment on a regular basis anywhere but in Eureka Street. Farewell, Michael. Go well. Great job, Michael. Your leadership and values have meant that during a time when the tide is so tribal and partisan that ES has given support in providing thoughtful bases for what is just, what is the common good and what is a humane alternative to the idolatry of the the market. It confirms a minority of voters that we are not deluded. Hopefully you can enjoy a spell and endure the separation anxiety with the assurance that you have left the ship in excellent hands.